Made up of a series of hanging partition boards, movable walls have become a must in many conference rooms, banquet rooms as well as many other projects. As a designer, if you are new to movable walls, here is a short introduction. 1. It’s ceiling mounted and hanging on ceiling. The movable walls on wheels should be as high as false ceiling. There must be at least 50cm between the false ceiling and concrete ceiling. 2. Three different thickness with 3 different soundproof performances are available for folding wall. 3. Four basic finishes of movable wall systems are MDF, melamine faced MDF, fabric, and leather. 4. What level of acoustics do I need? The sound is the oscillation of air pressure, which can be reflected, refracted or attenuated in the context of the room. 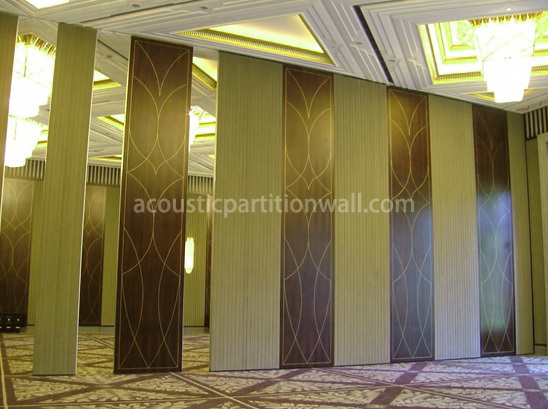 Sound attenuation is the primary criterion when selecting the performance level of an indoor partition. Weighted sound reduction index expressed as Rw and STC are used to measure the performance of partition. We produce a range of movable walls that provide sound reduction levels from Rw 30 dB to Rw 50 dB, where higher values ​​represent the upper limit of Sound attenuation based on laboratory tests. In addition to meeting rooms, movable wall partitions are also used in hotel, coffee room, exhibition center, exhibition center, college, art hall, restaurant, auction center, university, KTV, government office, testing center, bowling center, airport, school, library, and so on. We are here to help you create the perfect space division solution with movable sliding partition wall for your project. Our experienced workers able to handle the most complex projects.